The US State Department and the Federal Bureau of Investigation announced Tuesday a $3 Million reward for the information leading to the direct arrest or conviction of Evgeniy Mikhailovich Bogachev, one of the most wanted hacking suspects accused of stealing hundreds of millions of dollars with his malware. This is the highest bounty U.S. authorities have ever offered in any cyber case in its history. The 30-year-old Russian man who, according to bureau, is an alleged leader of a cyber criminal group who developed the GameOver Zeus botnet. Evgeniy Mikhailovich Bogachev, also known under the aliases "lucky12345," "Slavik," and "Pollingsoon," was the mastermind behind the GameOver Zeus botnet, which was allegedly used by cybercriminals to infect more than 1 Million computers and resulted in more than $100 Million in losses since 2011. GameOver Zeus makes fraudulent transactions from online bank accounts once installed in a target system with the capability to conduct Distributed Denial of Service, or DDoS, attack using a botnet, which involves multiple computers flooding the financial institution’s server with traffic in an effort to deny legitimate users access to the site. Not just GameOver Zeus botnet, the alleged suspect is also accused of masterminding the CryptoLocker Ransomware, which is designed to extort money from computer users by holding computer files hostage until the computer user pays a ransom fee to get them back. CryptoLocker encrypts victims' hard drives with strong AES-256-bit encryption before it demands money. The ransomware was widely distributed on the Gameover ZeuS botnet and, as a result, has infected hundreds and thousands of computers. Gameover ZeuS botnet was disrupted by the feds last year but remains operational. "Although we were able to significantly disrupt the Gameover ZeuS and Cryptolocker criminal enterprise, we have not yet brought Bogachev himself to justice," Assistant Attorney General Leslie Caldwell said in a statement. Joseph Demarest Jr., assistant director of the FBI's cyber division, described Bogachev as both "one of the world's worst'' and "brilliant at what he did.'' The authorities charged Bogachev with conspiracy, computer hacking, wire fraud, bank fraud and money laundering under a 14-count indictment last year. "We are turning to the world again for assistance in locating Bogachev," said FBI assistant director Joseph Demarest. "While he is known to reside in Russia, he may travel. With this $3 million reward incentive, someone, somewhere may see him and let the authorities know his whereabouts." In appearance, Bogachev is 5'9" tall, weighs around 180lbs, with brown eyes and brown hair. Last time he was seen in the Russian seaside resort of Anapa. He is believed to be still in Russia, although "he may travel," according to authorities. 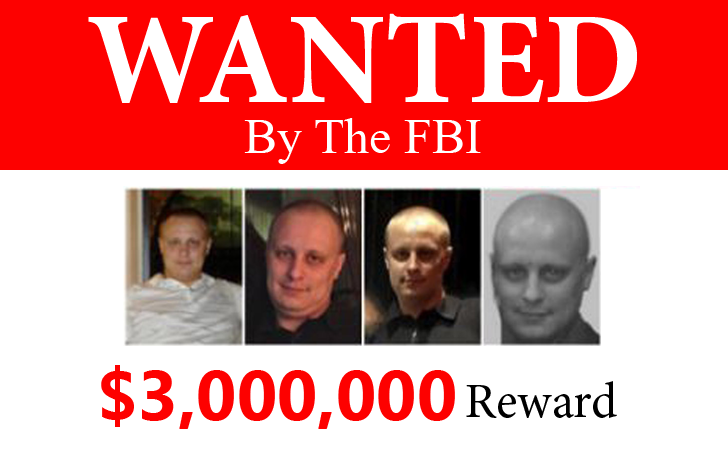 Bogachev is on the FBI’s Most Wanted cyber list. Anyone spotting him and wishing to be rewarded by the Federal Bureau of Investigation can call the feds at 1-800-225-5324, or can do the same online by visiting tips.fbi.gov.